Falmouth is one step closer to the construction of a new skate park after a meeting where over 60 skaters turned up to show their support. Falmouth Town Council and supporters of the proposal met at the town library where the prototype design for the park was presented. Since the removal of the old skate park in 2014, Falmouth Skatepark Project has been pushing forward plans to get a brand-new park built at Dracaena. The design proposed was created by Maverick Industries who have also built parks in Porthleven and are currently constructing a £650,000 park in Newquay called Concrete Waves. Falmouth has been without a skate park for almost four years and the group run regular fundraisers around Falmouth, one of which will take place at The Stannary on the 28th of April with guests from the local skate scene, a pop-up bar and music. The event has free entry and all donations go towards the building of the new Dracaena park. Falmouth is one step closer to the construction of a new skate park after a meeting where over 60 skaters turned up to show their support. Falmouth Town Council and supporters of the proposal met at the town library where the prototype design for the park was presented. Since the removal of the old skate park in 2014, Falmouth Skatepark Project has been pushing forward plans to get a brand-new park built at Dracaena. 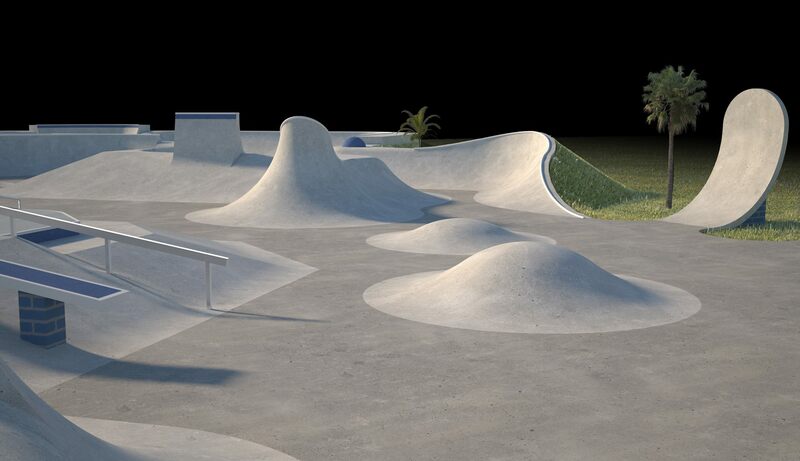 The design proposed was created by Maverick Industries who have also built parks in Porthleven and are currently constructing a £650,000 park in Newquay called Concrete Waves.